Senior guard Ali Lucero is this week’s Hay Rice and Associates Athlete of the Week. Lucero averages 10 points a game for the 14-1 #3 Liberal Lady Redskins. 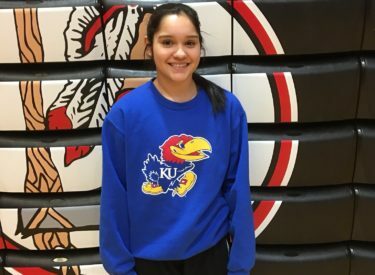 Lucero had 10 points and seven assists in Liberal’s 48-44 win over Guymon in the Big House on Tuesday. Lucero was named to the Salina Invitational Tournament all tournament team last month. Lucero also runs cross country and will participate in track or softball. She is also the vice president of the student council and is a homecoming queen candidate tonight. Liberal hosts Hays Friday night at 6 with Redskin Pre-game at 5:45 on 1270 and kscbnews.net.